Main Street, Muckhart, near Dollar FK14 7JN. 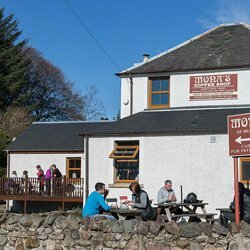 Tucked away in the picturesque village of Pool of Muckhart near Dollar, you can be sure of good food and a warm welcome here at Mona’s of Muckhart. Located only a few miles from the world famous Gleneagles Hotel, we specialise in serving delicious snacks, light meals and hot dishes straight from our purpose-built kitchen. Beautiful scenery and the many local walks on our doorstep make a visit to Mona’s an experience you’ll want to repeat. With friendly service and a relaxed atmosphere, come along and enjoy quality time and a cuppa with family, friends or colleagues. And, no visit to Mona’s is complete without trying one of our mouth-watering, home-made cakes or desserts. Home Baking at its Best! Treat yourself to a luxurious afternoon tea and enjoy a selection of sweet and savoury bites. Afternoon tea gift vouchers are available to purchase in the coffee shop. £16.95 for two. After a day enjoying the beautiful walks around Muckhart and Glendevon, our outdoor seating area is the perfect place to stop, refuel and enjoy the stunning scenery before continuing on your way. Opened in 2004, the coffee shop is dedicated to the memory of owner Moira’s Grandmother, Mona Cram. Her great food and gorgeous cakes continue to inspire our menus today! We’re easy to get to and we have plenty of parking to the rear of the coffee shop. We are open to everyone and our side entrance is wheelchair-friendly with full disabled access. There is plenty of room inside the coffee shop and we also have a spacious outdoor seating area to enjoy in warmer weather. We love what we do and we’re always looking for ways to provide the tastiest food and best service we possibly can. Luckily, we seem to be doing something right. Here are just some of the lovely comments we’ve had on TripAdvisor from our customers. Our layout is flexible and can be changed to cater for larger groups, private corporate functions and buffets. Just let us know your requirements when booking. Afternoon tea on Mother's Day was delicious. Hope to be back soon! 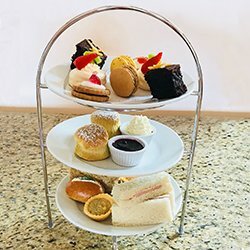 Are you doing afternoon teas on mother's day?